Tommy has removed the factory Milwaukee Eight exhaust system from our M8 Touring model Harley Davidson and is ready for installation of the Vance and Hines Power Duals with Eliminator 400 mufflers. Like most Vance and Hines exhaust systems, the Power Duals are an excellent combination of quality, performance, and style. These head pipes are unlike any other. The Power Duals integrate the exclusive Vance and Hines power chamber which is hidden behind a contoured heat shield that generates more horsepower and torque than stock. 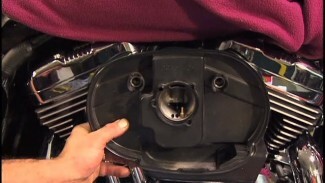 Vance and Hines have reconfigured the right side pipe design to help eliminate left side heat issues which were, at times, a problem for passengers. The new design also routes hot exhaust gasses below the footpeg and protects vital engine components and side covers from heat damage. The Vance and Hines Eliminator mufflers are large four inch mufflers finished at the ends with race inspired CNC machined billet end caps. The Eliminator 400s are designed to give Harley Davidson Touring Milwaukee Eight exhaust models a noticeable, deep, aggressive sound although quieter baffles are available. 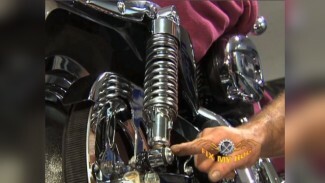 Tommy installs the stock Harley flanges and retaining clips onto the new headers. Milwaukee Eight exhaust flanges can almost always be reused. Clips can rust, distort, and weaken with time. If these clips are in poor condition, it is important that they are replaced before beginning assembly. It is helpful, but not always necessary, to install flange clips with flange pliers. If, however, using flange pliers, take care to not bend clips more than needed. Install O2 sensors. Use sensor reducers if needed for your application. It is important to apply Loctite never seize to threads of the sensors before securing into headers. It is a good idea to have a second set of hands available when positioning and hanging the head pipe. Start the stock Milwaukee Eight exhaust flange nuts by hand, then evenly snug the four nuts. You will not final torque at this time. Loosely install the forward most Vance and Hines exhaust clamp, then you can evenly torque the flange nuts followed by the forward most clamp. It is important to tighten the flange nuts to factory specs. 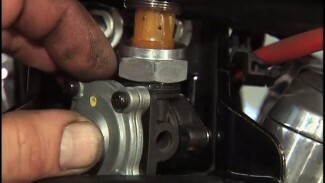 Over-tightening can cause damage to the exhaust studs at the heads. Next, install the supplied Vance and Hines bracket in the area behind the oil pan. Install the exhaust crossover pipe with the hanger clamp and torca clamp. After correctly orientating the crossover pipe, the clamps can be final tightened. Finally, install the left and right side mufflers, final orientate the heat shields and tighten. Don’t forget to use the provided spacer to correctly space the right side floorboard away from the head pipe. The Vance and Hines Power Duals and Eliminator 400 mufflers are an excellent upgrade to your stock Milwaukee Eight exhaust.